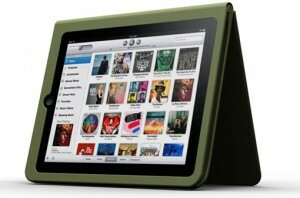 In case you have an Apple IPad in your midst you might want take extra care for your special gadget. Quirky a website which specializes in innovative products for use in just about anything has released its special sturdy case for the IPad called Cloak. But it is not merely a protective case for the IPad as it doubles as a handy stand where you can use it in situations you don’t want to place it in your lap. For vertical positioning you can put the front cover of the Cloak at the back folding it and becoming a versatile plastic support brace stand. The beauty of the support is that it can be adjusted to different angles the way you want it and once you position it to landscape mode the Cloak can also facilitate it in giving you the best position for the IPad. Once you need to type the Cloak has a smaller plastic support design to give you convenience in a low landscape angle when typing. At the very best you are getting enough protection for the IPad by having a material constructed from a non-slipping silicone made from a durable plastic component including its mechanism. Protection and versatility that is what Quirkys Cloak is all about.